In June, the International Olympic Committee (IOC) will vote on the 2026 Winter Olympic and Paralympic hosts. One way or another, they could be heading "back to the future". As things stand there are still two candidates in the race. By a twist of fate, the contenders of Cortina d'Ampezzo and Stockholm last staged Olympic events in the very same year. In 1956, the Olympic flag flew above Winter Olympic hosts Cortina and also in Stockholm which held the equestrian competition six months before the rest of the Summer Olympic programme took place in Melbourne. Both events were simpler and very much cheaper. Cortina have a joint bid with Milan this time but they were out on their own when they campaigned for 1956. Three grandees of Italian sport were key figures in getting the Games. IOC member Count Alberto Bonacossa sadly did not live to see them, while Guilio Onesti was later a driving force in the growing influence of National Olympic Committees. Bruno Zauli, better known for his role in creating the European Cup in athletics, also had a key role. The decision was made at the 1949 IOC Session in Rome. Nowadays, the voting Session must not take part in a nation which is bidding. This is why the 2019 Session was switched from Milan to Lausanne. Cortina's opposition came from Montreal, Colorado and Lake Placid but they swept to victory. The Italian Olympic Committee (CONI) took "all initial steps and preliminary work", it was said. They set aside an annual 600 million lira "for the requirements of the Olympic Winter Games". 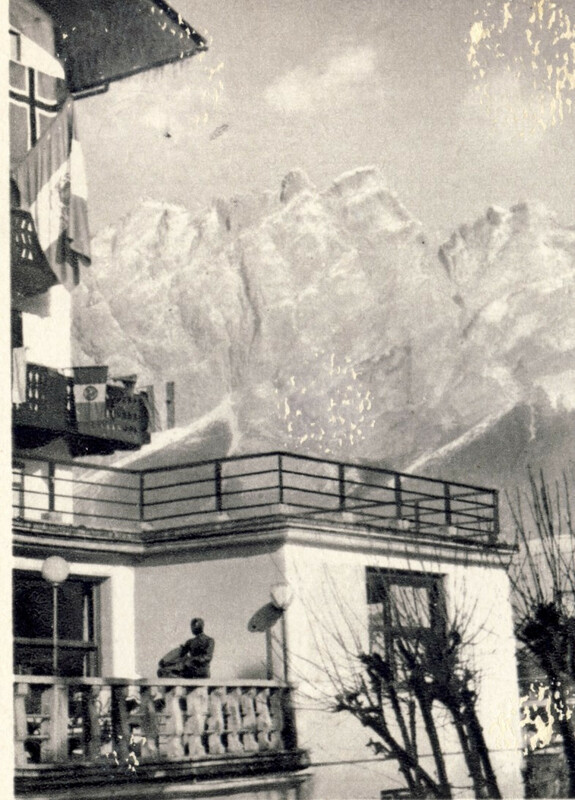 Before 1956, Cortina admitted it had "only just enough sports installations to satisfy the needs of those who come as tourists". 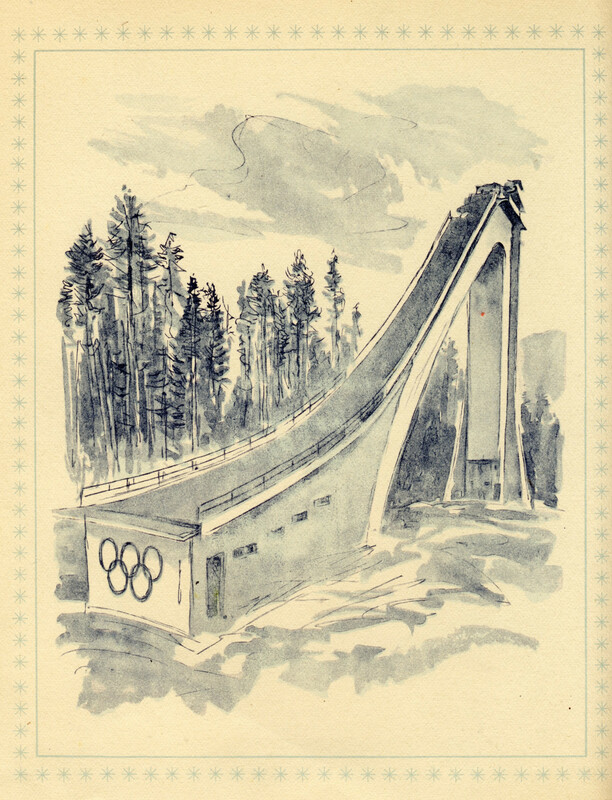 A party of observers was sent to the 1952 Oslo Games for "a careful study of precedents". It was only after these Games that a formal Organising Committee was established to build on the work done by CONI. The dates were fixed after consulting weather statistics going back to January 1924. Speed skating was to be on a frozen natural lake at Misurina, some 13 kilometres from Cortina itself. International Skating Union delegate Sven Laftman was skeptical at first but was persuaded to accept the change after seeing other competitions held at the venue. The main ice stadium was to have a capacity of 8,000 which was increased by temporary seating to 15,000 during the Games. Although the structure was concrete it was paneled over with fir and Siberian cedar. The stadium lighting was designed so as "not to shine into the eyes of players or the public and so as not to be reflected on the surface of the ice". In those days ice hockey was held outdoors. The new arena was opened after a blessing from a bishop, the Vescovo di Bressanone, Joseph Gargitter. This was followed by an ice hockey match and a figure skating demonstration. "My impressions are very favourable where technical organisation is concerned," wrote Olympic chancellor Otto Mayer after a visit. The official film of the Games begins with scenes showing traditional log cabins in the mountains. IOC President Avery Brundage was to describe the setting as "an entrancing winter fairyland of the Dolomites". The Opening Ceremony, held in an open air arena, was a far less ambitious affair than today. Technology was simpler. Marshalls used chequered flags in the Olympic colours to semaphore messages. Judges displayed their marks using numbered boards. At the snow sports stadium, organisers boasted 22 telephone lines "with the possibility of carrying 16 long distance calls at the same time". The Games were televised across Europe for the first time. Viewers saw Austrian skier Toni Sailer win three golds to stamp his name indelibly on these Games. The great Swedish cross-country skier Sexten Jernberg came away with more medals but only one gold. The Soviets made their winter debut, dominating speed skating and winning their first title in men's ice hockey. It was also in Cortina that both East and West Germany participated together for the first time, delighting IOC President Brundage. "The Games were a great success from an athletic point of view," he said. "Even more important was the fact that the Games proceeded in a truly Olympic atmosphere with contestants from all sections of a strife torn world participating for the glory of sport without commercial or political consideration." Stockholm had never expected to stage an Olympic event in 1956. Melbourne had won the right to stage the Olympics, but in 1953 alarm bells were ringing when Australia's Hugh Weir told his fellow IOC members: "Only one thing worries us, it is the quarantine imposed by Australian law on all horses coming to Australia." It was decided to move the equestrian events. Paris, Rio de Janeiro, Berlin and Los Angeles all joined Stockholm in the contest to host them . "STOCKHOLM HAD THE HONOUR TO ARRANGE THE FIRST EQUESTRIAN COMPETITIONS 42 YEARS AGO. WE THINK IT IS ONE OF MANY GOOD REASONS FOR GIVING STOCKHOLM ALSO THE SOLE OLYMPIC EQUESTRIAN COMPETITIONS OF 1956," a cable from the Swedish Olympic Committee barked. The vote was taken in Athens and Stockholm won convincingly. Construction work on a cross-country course to the north of the Swedish capital began in December 1954. The Olympic Stadium in the heart of the city was to be the setting for the show jumping and dressage phases of competition. Competitors were accommodated in two military colleges at nearby Karlberg and Nasby. "The shortage of hotel space being one of our main concerns, it would be quite impossible to accommodate the teams in hotels of equal standard," an official bulletin said. "We are not yet in a position to state whether each competitor will have a room of his own but under no circumstances will there be more than two occupants per room." The cost of accommodation was set at $5 a day. The grooms were to be put up in nearby villages at $2.50 a day. When the Organising Committee reported to the IOC on their work they noted that "His Majesty the King takes great interest". This interest took the form of an invitation to the many European royal families including Prince Francois Joseph of Liechtenstein. "Our King has been kind enough to suggest that royal visitors should be his personal guests at the royal castle," organisers said. "I would like to know if you or other members of your family will be coming." One royal party caught the imagination like no other. The Swedish newspapers enthusiastically charted the progress of the Royal Yacht Britannia which carried Queen Elizabeth II and Prince Philip, keen riders both, to watch the Games. An Olympic flame burned in Stockholm. It was the only time that three separate flames burned in the same year. "We plan to let riding couriers bring the Olympic flame to Stockholm," said Robert Seffelt of the Organising Committee. He asked if the IOC had "any objection against our bringing the Olympic flame from Cortina to Stockholm". "If not, we intend to ask the Cortina Organising Committee to keep the flame alight until it may be fetched by our couriers," he said. In fact the Cortina flame was lit in Rome and was not technically an Olympic fire. Perhaps surprisingly, IOC President Brundage raised no objection but while in Cortina for the Winter Games, he discussed the matter with Ioannis Ketseas, the IOC member in Greece. "Taking into consideration the wish expressed by the IOC President and the conditions which obliged to split the 1956 Olympic Games, he has decided quite exceptionally to proceed to the lighting of the flame in Olympia and send same to Stockholm," it said. Women also took a leading role in the Torch Relay. Lis Hartel, a 1952 dressage silver medallist, rode with the flame in Copenhagen and throughout Sweden many female riders carried the Torch which was transported on horseback throughout. Dressage rider Hans Wikne arrived in the stadium carrying a flaming Torch to light the cauldron in the centre of the arena. Gymnast Karin Lindberg was one of the runners waiting to light a second brazier. She was the first woman to do so. West Germany's Hans Gunter Winkler won gold in both individual and team show jumping. The feat was matched by Henri St Cyr of Sweden in dressage. His compatriot Petrus Kastenman won the individual eventing title but Great Britain won team gold. Bertie Hill's mount Countryman was owned by the Queen and the team celebrated victory as guests on Britannia which was moored in the harbour. The medallists received their medals on horseback. "They will ride onto the field through the Marathon Gate and line up facing the royal box, the victor in the middle," organisers said. The medals themselves were unique. "As the Games are quite special, I think you are entitled to elaborate your own designs," said Mayer to Selfelt. "As there is only one sport on the programme, I suppose you might remind it with an equestrian subject on one side." In additional to the medal, organisers confirmed that "a cockade will be fastened to the horse's bridle".